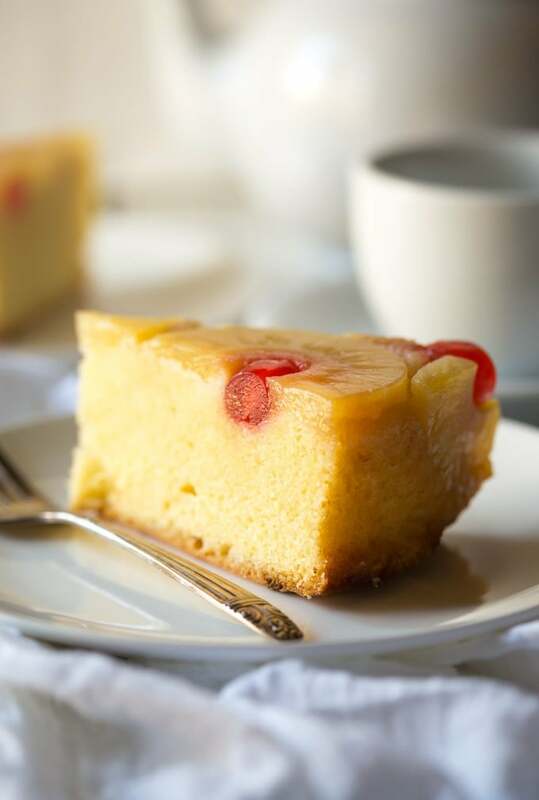 This is the only Gluten Free Pineapple Upside Down Cake recipe that you’ll ever need, it’s so easy to make and tastes delicious! Can be made dairy free too. For this recipe I essentially doubled my regular cake recipe to make my gluten free Pineapple Upside Down Cake. If you prefer a smaller cake just half my ingredients and bake it for a little less time, you can still use the same 9 inch pan but obviously the cake will be much thinner. Personally I’ll take all the cake I can get so a double batch works for me! The first step is to add the gluten free flour, baking powder, eggs, sugar, margarine or butter, xanthan gum, vanilla and milk into a bowl and mix until blended. Then you need to melt the remaining margarine (or butter) and sugar together and pour into the bottom of a 9inch cake pan. do NOT use a springform pan, or a cake pan with a removable bottom, or all the sugar mixture will leak out. I almost always create my own all purpose gluten free flour blend, there are two reasons for that. It’s typically cheaper to mix and create your own flour blends, so that’s a big incentive. It’s easier than you might think to make your own blend and my recipe for all purpose gluten free flour explains how I make it, and how you can easily substitute one gluten free flour for another. The second reason is that using my own blend produces better gluten free baking, every time! I can adjust the amount of gum needed on a per recipe basis, or omit it if necessary. Many of the commercially prepared gluten free flour blends have either xanthan gum or guar gum already added, which is not always a good thing as the amounts vary from recipe to recipe. Lastly, I always bake by weight and use a digital kitchen scale to weigh the ingredients. The results are consistent this way, especially if I use different gluten free flours in my mix from one recipe to the next. As mentioned above you’ll need a good gluten free flour blend. If you won’t want to make your own blend then I recommend picking up a good ready made gluten free flour like King Arthur‘s. You’ll also need xanthan gum to replace the gluten in your baking. It’s a little pricey but a little goes a long way, I store it in a ziplock bag in my freezer. I prefer to use candied cherries for this, but if you can’t find any maraschino will work just the same. More gluten free baking recipes you’ll love! I have many gluten free baking recipes that I know you’ll enjoy. If you’re looking for another easy cake recipe then make sure you check out my gluten free Chocolate Cake recipe, it’s made all in one bowl and is super easy to make! How about some cookies?! I have many cookie recipes on the blog, but my two favorites are my Gluten Free Chocolate Chip Cookies and my Gluten Free Lemon Cookies. And if you’re looking for another lovely cake, my friend Cindy at Vegetarian Mamma has this wonderful Easy Apple Cake recipe you’ll want to try! And be sure to check out this Gluten Free Cookie Cake from A Mindful Mom, it looks delicious! 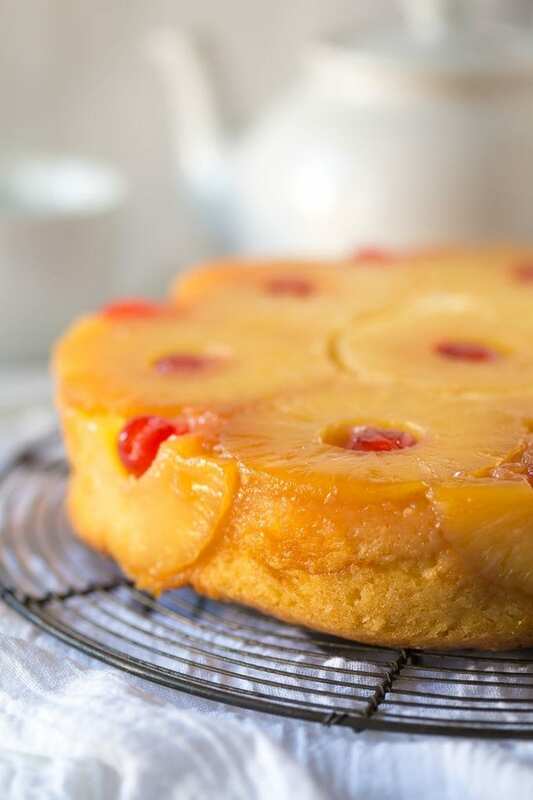 This is the only Gluten Free Pineapple Upside Down Cake recipe that you'll ever need, it's so easy to make and tastes delicious! Put the flour, baking powder, eggs, sugar, margarine, xanthan gum, vanilla and milk into a bowl and mix until well blended. Melt the remaining margarine and sugar together and pour into the bottom of a 9inch cake pan. Do not use a springform pan or the margarine sugar mixture will leak out. 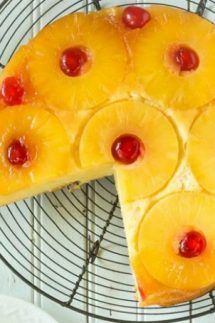 layer the pineapple and cherries like you see in the photograph in the post. Pour the batter over the top and spread out evenly. Bake for 40 - 50 minutes minutes at 350, or until a toothpick comes out clean from the middle of the cake. 1. I bake by weight as I find that gives the most consistent results, especially when baking gluten free. One cup of your gluten free flour blend may not weigh the same as my blend, all the commercially available blends have different mixes and ratios of flour in them. I’ve weighed cups of different blends of flour and noted that a cup of gluten free flour can vary in weight from 125g up to as much as 170g depending on how you scoop it, and what type of mix you use. You can see how this could drastically alter the outcome of a recipe. I recognise that most Americans are used to the cup method which is why I also include those measurements, but they may not give you accurate results as they are approximate only. If you are a keen gluten free baker I would encourage you to invest in a digital kitchen scale (affiliate link) you can get one for only $10 - $15. I love this cake! The texture looks fantastic. I actually made a gluten free version years ago – and loved it. Your’s is much prettier! My husband’s coworkers always say they do not care what the cake looks like, as long as it tastes good, but I would be with you on that bright pink colouring! But look at it now?! This is simply beautiful!! I would have no idea about the dye in the cherries being an issue! I would have just went on my day with a pink cake! But this is a beauty! This is such a pretty cake…pink or not! Sharing this with my gluten-free friends for sure! What an absolutely beautiful upside down pineapple cake. My mom used to make this for me when I was younger. I need to start making them for myself. Thanks for the inspiration. This is such a gorgeous cake! I love that you made a gf version! I love having GF option of the classic desserts. This is gorgeous! 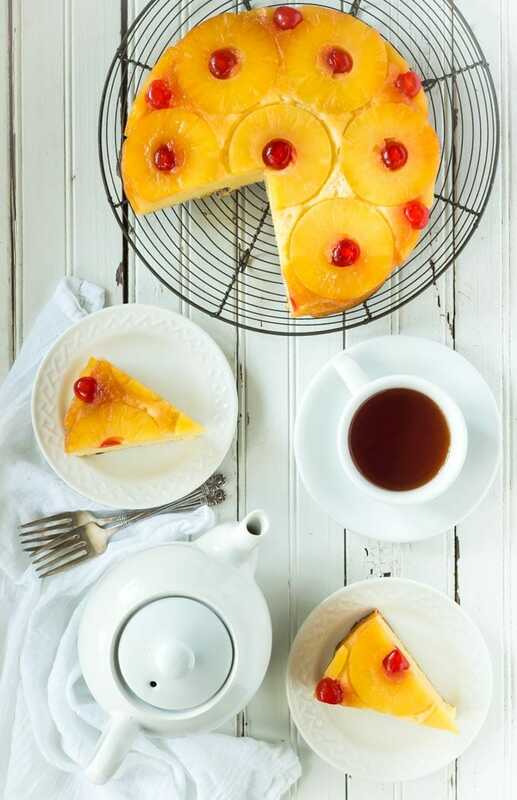 I’ve actually never tried a pineapple upside down cake before, but this is making me want to! It looks great! Would there be any difference if I used regular butter in place of the margarine? Would the amount need altered any? Hi Karen, regular butter would work just fine in place of margarine and the amount should be exactly the same. I am no longer able to tolerate dairy so that’s why I use dairy free margarine instead of butter. So you’ll want to stock up in November and December, or you can order them on Amazon year-round. I’d eat that fruitcake, lol! That’s what we figured out eventually about the availability of the cherries, I almost ordered some from Amazon until my husband found them in Kroger. Do you let the cake cool completely in the pan before turning it out? Hi Sarah, I would let it cool some because GF cakes tend to be a bit more fragile and it may break when it’s hot. That said, I often break the rules and turn it out hot if we want to eat it hot, but I do make sure I’ve lined the base and the sides so then it won’t stick and should slid out easily. Delicious, and the cake is very light! I used butter instead of margarine. Well sad that this what not dairy free like the pic says. Hi Anna, where’s the dairy? I used Vegan Margarine and Soy milk to make the recipe you see in the photo, there’s no dairy in it unless someone prefers to use regular butter or milk. I don’t normally bake with flax eggs and I have not tested this recipe with them so I’m really not sure how it will turn out. Usually it will tell you on the box how much flax to substitute for regular eggs, the texture of the cake will be different without the eggs though but I think it will work. Hi, I was wondering if I could use fresh cherries, frozen cherries, or cherries meant for pies (in cans)? I have a hard time finding candied cherries and dislike maraschino intensely. My worry is that any of these options would cause too much moisture and end up making rhe cake raw or underbaked. Thank you! I think fresh cherries should work, frozen cherries and the pie filling might have too mush moisture for this recipe so I’d be worried the cake would fail. I used your batter recipe for a rhubarb upside down cake and it was amazing! Finally a GF cake that tastes good and does not crumble. My guests (who can eat wheat) loved it. I’m so glad your guests love it too! Hi, I made this cake for a family member and prepared it a day in advance for her. Should it be refrigerated? I think it will be ok on the countertop as long as it’s in an airtight container.